CraigCraig — With big-game herds moving back to higher ground, Colorado Parks and Wildlife has reopened the Byers Canyon Shooting Range for 2013, according to a news release. — With big-game herds moving back to higher ground, Colorado Parks and Wildlife has reopened the Byers Canyon Shooting Range for 2013, according to a news release. 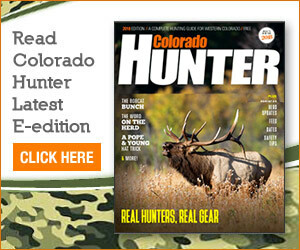 Craig — With big-game herds moving back to higher ground, Colorado Parks and Wildlife has reopened the Byers Canyon Shooting Range for 2013, according to a news release. The range in Hot Sulphur Springs is open to the public seven days a week from sunrise to sunset and does require membership fees. It has five centerfire rifle ranges at 25, 100 and 200 yards, a .22-caliber rifle range, a shotgun range and a handgun range. The range has minimal supervision, but CPW property technician Doug Gillham reminded those looking to shoot at Byers Canyon that there are important rules to be followed. In 2012, tracer ammunition was used at the range, which twice led to fires. “Anyone caught with tracer rounds at the range may face a substantial fine and be held liable for damages and fire department expenses if the use of the illegal ammo leads to a fire,” said Lyle Sidener, Area Wildlife Manager for Hot Sulphur Springs, in the release.